What passing-bells for these who die as cattle? - Only the monstruous anger of the guns. Can patter out their hasty orisons. And bugles calling for them from sad shires. What candles may be held to speed them all? Shall shine the holy glimmers of good-byes. And each slow dusk a drawing-down of blinds. 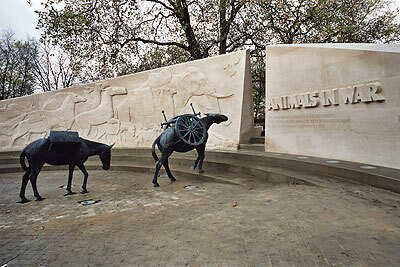 Eight million horses and countless mules and donkeys died in the First World War. They were used to transport ammunition and supplies to the front and many died, not only from the horrors of shellfire but also in terrible weather and appalling conditions. Mules were found to have tremendous stamina in extreme climates and over the most difficult terrain, serving courageously in the freezing mud on the Western Front and later at Monte Cassino in World War II. Equally they toiled unflinchingly in the oppressive heat of Burma, Eritrea and Tunisia. There are many inspiring and often tragic stories of the great devotion and loyalty shown between horses, mules and donkeys and their masters during some of the bloodiest conflicts of the 20th century, as can be read in Jilly Cooper's moving book Animals in War, published by Corgi. 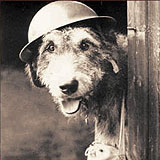 The dog's innate qualities of intelligence and devotion were valued and used by the forces in conflicts throughout the century. Among their many duties, these faithful animals ran messages, laid telegraph wires, detected mines, dug out bomb victims and acted as guard or patrol dogs. Many battled on despite horrific wounds and in terrifying circumstances to the limit of their endurance, showing indomitable courage and supreme loyalty to their handlers. More than 100,000 pigeons served Britain in the First World War and 200,000 in World War II. They performed heroically and saved thousands of lives by carrying vital messages, sometimes over long distances, when other methods of communication were impossible. Flying at the rate of a mile a minute from the front line, from behind enemy lines or from ships or aeroplanes, these gallant birds would struggle on through all weathers, even when severely wounded and exhausted, in order to carry their vital messages home. Elephants, camels, oxen, bullocks, cats, canaries, even glow worms — all these creatures, great and small, contributed their strength, their energy and their lives in times of war and conflict to the British, Commonwealth and Allied forces during the 20th century. The Animals in War Memorial, Brook Lake, Park Lane, London is a lasting tribute to them all. I did not know about this memorial, though we have a large museum to World War One here in the Kansas City area. We have been several times, but I am going to go back now, to see if the animals are credited.